Heartland Family Service is an organization based in Omaha with the mission to "strengthen individuals and families in the community through education, counseling and support services." Kelli Welveart posts job openings for Heartland Family Service on NebraskaBehavioralHealthJobs.com. She primarily posts harder-to-fill positions which she describes as more clinical or therapeutic in nature, including therapists, rehabilitation practitioners and nurse practitioners. The openings Heartland Family Service posts are located in Omaha and Council Bluffs. "[The site] is very easy to post on," Welveart said. She is hoping to get some great candidates to apply for Heartland Family Service's current openings, which can be viewed here. One of the first impressions potential employers will have of your experience and your goals is your resume & cover letter. Get helpful tips for writing your first resume here and read tips on writing a cover letter as a student/recent graduate here. NebraskaBehavioralHealthJobs.com is a completely free website specifically made for Behavioral Health Jobs in the state of Nebraska. Once you've uploaded your resume, make sure to upload it to our website. Click here to learn how. Many Behavioral Health employers in Nebraska browse relevant resumes when they post new job openings on the site before you even apply to them! 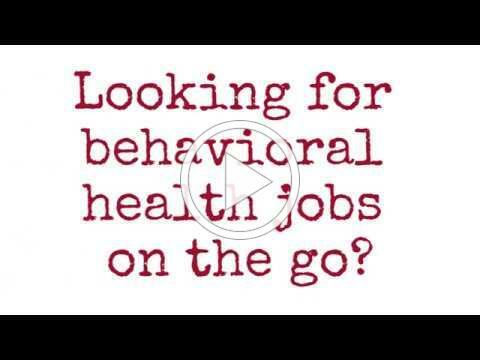 It's also totally free to search for and apply to behavioral health jobs on our website. Searching for jobs is as easy as typing in keywords and a location and clicking "search." Right now, there are more than 50 job openings listed on our site, and your future career could be one of them! It's also easy to search for jobs on the go with our mobile app. For more information you can watch our video here. How to answer "Tell me about yourself." One of the best ways to reach new grads and other potential employees is to post your jobs on NebraskaBehavioralHealthJobs.com ! If you're a BH employer in Nebraska, it is totally free to post unlimited jobs and search resumes on our site. You can learn more about posting job openings to the website here. There are also currently more than 30 resumes posted to our website, which you can search through for free to find and reach out to candidates who may be perfect for your organization. Have you downloaded our free app? Watch this 30-second video, and learn how to make your job search easier! Do you have a hiring success story or recruiting tip to share? This website, made possible with the support of private and state funding, was developed in collaboration between the Nebraska Regional Behavioral Health Authorities and Behavioral Health Education Center of Nebraska (BHECN) to provide FREE access to employers and job seekers alike.